Freemasonry in Kororareka had its beginnings in an initial meeting of those interested, in the Methodist Church Hall on June 14th 1929. Meetings were also held at The Annex (the present Gables) and the Town Hall, where three shillings an hour for electricity was considered too expensive, so members were asked to bring along Coleman table lamps. 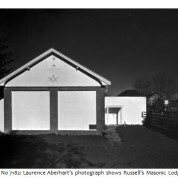 The foundation stone for the Church St Lodge was laid on the 5th of August 1946. A casket underneath the stone contained a list of foundation members, a roll of present members, a Bay of Islands newspaper, a photo of the Grand Master and coins of the realm. The new temple was officially opened on 22nd September 1950. Lodge Kororareka No 304 held its 750th meeting in October 1997 and still meets monthly in the same location. The Freemasons of New Zealand funded exhibition “Squares and Compasses: Freemasonry in New Zealand” shows at Russell Museum from April 9th; it includes symbolic tools, collars, aprons and other Masonic regalia and memorabilia not normally on public display. See the “Freemasonry Revealed” article, also in this issue, for more on this exhibition.